Temples in Ayutthaya, an Overview. Must See Wats and Travel Tips for Ayutthaya. Prang at Wat Phutthai Sawan, early Ayutthaya period. 'Thai'-styled prang (rounded). The top of the prang tapers off gradually. We have visited most of the important temples around Ayutthaya Historical Park. Somehow we also managed to skip one or two. In any case, we advise that you need about two full days to cover most of the sites. This amount of time is the same whether you use a bike, a car, or a touring coach. Most visitors will only spend a few hours in the old capital, but this will not allow you to have a full overview of its culture and history. The Early Ayutthaya Period, the Middle Period, and the Late Ayutthaya Period. From an architectural viewpoint, we can make simple distinction between the three periods. 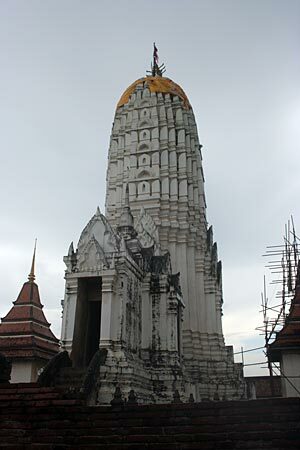 During the first period, the Prang (adapted from Khmer architecture) was the most prominent structure within the temple compound. During the middle period, the chedi (or stupa), often in Sri Lankan (rounded) style became the most visible monument. During the later Ayutthaya period, the Ubosoth or Coronation Hall became larger and larger, and while the prangs and chedis are still there, they are less prominent. Please bear in mind, that quite a few of the older temples have been restored. Therefore elements of newer architecture may be seen in the older temple compounds. Wat Mahathat (early) - Famous Buddha Head in tree, lots of ruins. Wat Ratchaburana (early) - Impressive main prang, large compound. Wat Phanan Choeng (buildings contemporary) - Huge ancient Buddha Image, very busy wat. Wat Choeng Tha (late) - Prang, interesting quiet site. Wat Mongkhon Bophit ('modern period') - Active wat, Large ancient Buddha Image. Wat Kasattrathirat (late) - Whitewashed prang. Wat Phu Khao Thong (late) - Large Chedi. Wat Lokayasutharam (middle) - Large reclining Buddha. Wat Som (early) - Prang, stuccos. Wat Maheyong (middle) - Elephant sculptures. Wat Worachetharam (late) - Prang. Add-on : The Prang in Khmer and Ayutthaya Architecture.